We've all been there. You're looking at a site that sells already pricey fitted diapers, usually ranging in price from $18-35.00 each for the natural un-dyed variety. They look so soft, so luxurious, but they're not even waterproof, they require a cover. Can you make yourself do it? Spend so much on one fitted? Then it happens, you see them, the hand dyed diapers. Same luxurious fitteds dyed in beautiful vibrant colors. Their names are usually just as magical and awe inspiring. Neapolitan, Pumpkin Pie, Sorbet...you begin to drool. Five minutes ago you were trying to talk yourself either into or out of buying an $18-35 dollar diaper. Now you can't stop your mouth from watering at the site of their even higher priced dyed versions. You tell yourself every babe deserves at least one "special" (a.k.a exspensive) diaper, right? 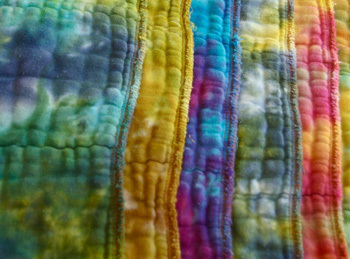 The truth is, hand dyed diapers are hard to resist. They're like a work of art that your kid poops in. But they don't have to cost you an arm and a leg, you can learn to dye your own diapers. From cotton prefolds to bamboo velour, there are tutorials and dyes for every fabric imaginable. I've decided to post a link for you all to check out in case you're thinking of dying your own diapers. All About Hand Dying Addresses issues like The Dyeing Process, How to keep the tag from getting dyed, What types of dyes to use on which fabrics, and much more. This is a really informational site and it will really give you a good idea of what's involved so that you can decide if it's really something you'd like to try or something you'd like to leave up to the experts. Did you even know that you can purchase some of your dyeing supplies on Amazon? Plus, there are even tons of videos and demos on Youtube which can help you understand how to use the different dyes. Don't forget to check with the diaper manufacturers warranty before dying your diapers if you are concerned with the possibility of voiding their warranty. Some companies such as DryBees specifically state that the use of Procion Dyes does NOT void their warranty. Hope you all found this information helpful! Have fun dyeing.